will at the Crowne Plaza Hampton Marina Hotel. 700 Settlers Landing Road, Hampton VA. 23669. October 26-29, 2016 Group Rate $103.00 + Taxes. Their mission was to provide avionics general support for all of the Army helicopter units in Vietnam. All of the Avel units came under the command of the 34th General Support Group, USARV. The parent organization of Avel North was the 14th Transportation Bn., 34th General Support Group. 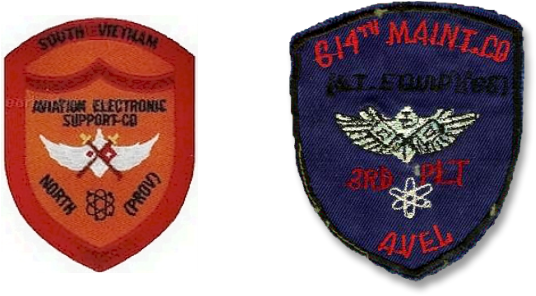 The 34th General Support was part of the USARV Command until December 1971 when it was transferred to the control of the 1st Aviation Brigade. Avel North was formed from the assets of several signal detachments. It was formed by USARV General Order 1397 dated 2 March 1966. It consisted of three platoons and provided Direct and General Support for over 1,100 aircraft in Military Region 2. Among the units supported were the 1st Cavalry Division, 4th Infantry Division and the 17th Combat Aviation Group. The Avel North platoons were located in Nha Trang, Qui Nhon and Pleiku. Eventually some assets were moved to Tuy Hoa. Avel North was redesignated the 614th Light Equipment Maintenance Company on 1 December 1969. It was officially deactivated on 15 January 1972. The Avel North shops were located in Nha Trang and Pleiku. Eventually some assets were moved to Tuy Hoa. Pedro died on 9 March 1999. John will be happy to hear from any Avel vets. Send an email to Jack McCabe ( jack@jackandpatmccabe.com ) for contact information.